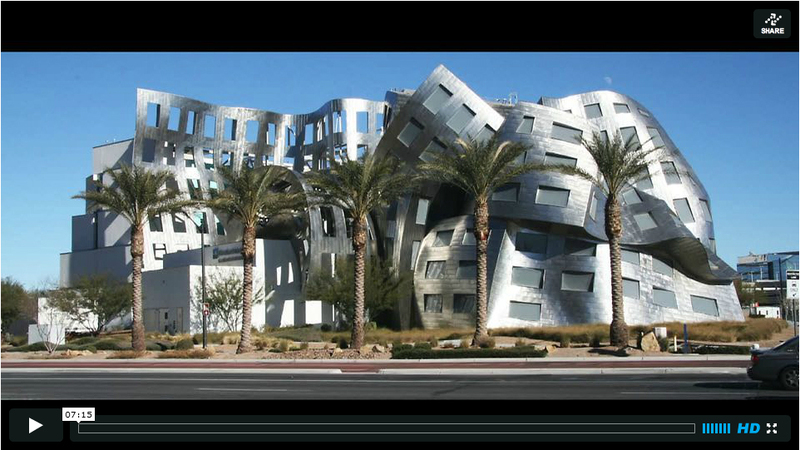 The Cleveland Clinic Lou Ruvo Center for Brain Health in Las Vegas is a joyful, youthful and exuberant building. It shakes the assumption that innovative freshness has to do with an artist’s age. Like Matisse’s paper-cut collages, conceived at an old age, Frank Gehry shows us that he is a young architect at eighty–four. His “signature” remains unmistakable, but we should not confuse it with previous undulating structures such as Bilbao’s Guggenheim, L.A.’s Disney Hall or Seattle’s Experience Music Project. In Las Vegas he was in to take new risks: “I did try to study a curtainwall that wasn’t just vertical” Gehry said. 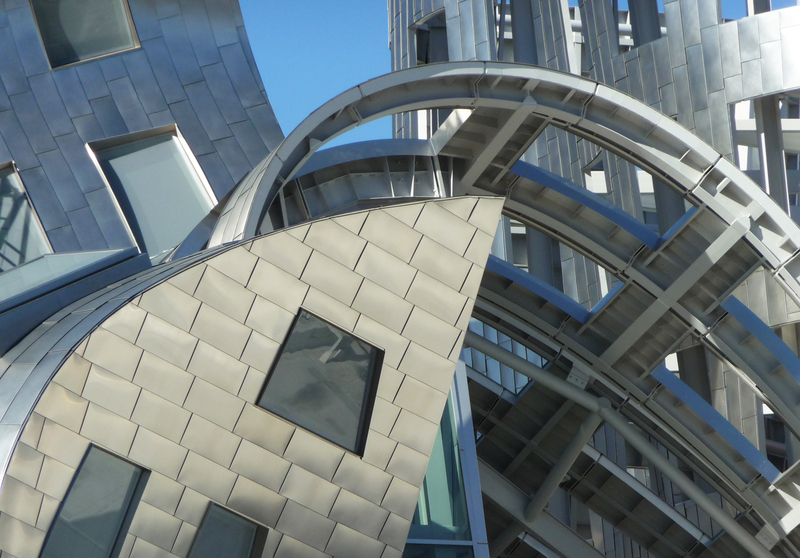 Larry Ruvo, a Nevada’s chief liquor distributor, called Gehry and asked him to design a clinic and research center for neurocognitive disorders, such as Alzheimer’s, Parkinson’s and Autism, to name just a few out of about one hundred brain-related diseases. The new building was to be named after his father, Lou Ruvo, who suffered from Alzheimer’s before he died in 1994. Something personal contributed to change Gehry’s mind. 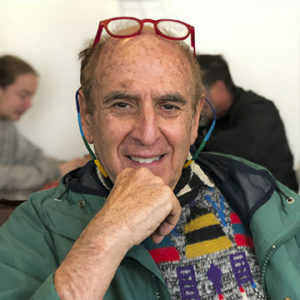 Milton Wexler, his psychoanalyst, had lost his wife to Huntington’s disease. In 1969 Wexler started a foundation for the study of the disease, of which Gehry became vice president of the board. The similarity of the subjects attracted him. It was a worthy cause. Larry assured him that Huntington’s disease was part of the center’s medical mission. He also gave him creative freedom to design an events space that would play a supporting role by generating income from rentals. The small corner site flanked by two wide boulevards and parking lots is located on the north side of the city, just off interstate 15, far from the Strip. Planned to be part of a 61-acre Symphony Park – one of the largest urban redevelopment projects in the United States – its neighbors are the massive 5,000,000 square-foot (460,000m2) World Market Center designed by Jon Jerde, the 350,000-square-foot (33,000 m2) Clark County Government and Performing Arts Center, designed by Fentress Architects, and a retail outlet shopping mall. 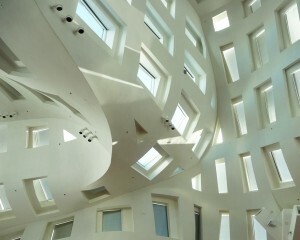 The program of the comparatively modest 65,000-square-foot (6,000 m2) of the Lou Ruvo Center’s is simple. It includes clinical, research and 13 outpatient examination rooms, labs, a reception area, an office suite for health care practitioners and researchers, a small library, a 9,000-square-foot events space – the Life Activity Center – a gallery, an interactive “Museum of the Mind,” a kitchen and an outdoor café. Gehry’s design concept is a metaphor of brain lateralization, the “logical” and the “creative” halves. Most of the functions are framed within four sectors built conventionally and finished with stucco. Building materials were sourced regionally. LED lighting proliferates. The landscape is made of drought-resistant plantings. The drama starts when a drape of metal cladding on a steel frame is posed to rest over conventional concrete columns, embracing the four sectors. Like in the design of airplanes, a monocoque structure is created; the chassis becomes part and parcel of the body. The “corpus callosum” of the clinic is the central T-shaped unfenced court. Open to breezes from east and west, has an urban character, like that of a piazza resulting from the intersection of medieval streets. The steel structure over it, a bowed trellis, is more like the crown of tree than of a common post and beam grill. An open café, animated by aqua, lemon and red walls and by Gehry-designed silver, blue, yellow, red and white furniture, is the focal point where people meet. The layout of the northern wing has slight disjunctions, like in those of Alvar Aalto’s and Hans Scharoun’s buildings. They brake the orthogonally without sacrificing practical use. Large windows bring in the joyful animation of the steel structure. The Life Activity Center, as the events area is known, is acceded from the court. Upon entering from the court, space becomes breathtaking. It is a human-made cave partially supported by stylized trees of square trunks and angular branches. Its perception hits deep into the prehistoric areas of our brain. The shell is punctured by an irregular assembling of 199 triple-glazed windows and skylights, each different from one another. Natural light is controlled through motorized blinds and can be changed at will. Everything seems to be in motion; like in the baroque spaces of Bernini and Borromini, or in Le Corbusier’s Ronchamp and Aalto’s Vuoksenniska churches, the Life Activity Center is an uplifting spiritual space. The Lou Ruvo Center carries a powerful message: great architecture can be humanistic, daring, economically feasible, sustainable and historically literate, all at the same time. just amazing! Thank you for sending this. Maybe I can now convince my husband to visit Vegas. Thank you for your comments. Yes, it’s worth a visit. I love the ebb and flow. It is a bit reminicent of Gaudi in Spain whose work I especially admire. Gaudi is imaginative and colorful where Gehry is smooth, steel, and flowing. But they are both creative geniuses who revolutionize space in such peasing ways.